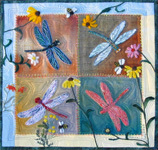 THE PATTERN: This is one of my newest felted applique patterns. This pattern has SIX full color pages showing the full quilt and detail photos each of designs on my quilt. My quilt top measures 59" high x 51" wide. 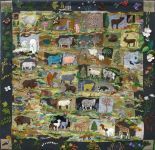 There are 26 Letters and 26 animal drawings from the original Alphabet patterns, 26 more animal drawings that you cut out of wool fabric. These appliques then get poked with a hand felting tool, into the background blocks to tack them down so they don't move. Then the wool fibers are poked with the felting tool to make the sheep look more real than they would in cotton fabrics. The fibers get hooked together magically because wool has barbs on each fiber and they mesh together. There are so many different textures and colors available for the critters you decide to use on your quilt. The pattern includes SIX 8 1/2" x 11" pages of color photo of the quilt and details. It weighs 9 ounces. This pattern is no available as a PDF. If you are looking for a unique project that will keep you occupied while on vacation, or commuting or just plain waiting for kids at practice, or while having cancer treatments, this project will add many hours of enjoyment to your life. When you are finished you'll have an heirloom quilt to pass down for generations. This is a project that you can pick up and add something and put it down till your next spare moment. The quilt will tell you what to add as you play with it. I used my own hand dyed wool backgrounds, but you could substitute wool from your stash, or wool clothes that you cut up. I am so excited about the embroidery. The more I do it it, the better I get. Give yourself some slack, and don't expect that your first efforts will not be good enough. We are always our own worst critic. This quilt was made one block at a time. The wonderful advantage of the whole process is that it is portable. 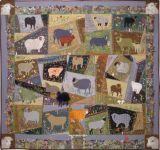 You make a couple of blocks then join them together, and add some roving (fibers) for the sheep to walk on, and some hand embroidery, and it grows and takes on a life of its own. Your quilt could be smaller by making fewer letters, spelling a word or an name, or a saying, like "Count Your Blessings" or "Welcome". ACCESSORIES YOU WILL NEED: The wool fabrics could be collected from thrift stores which is appealing if you like to reuse and recycle. This is time consuming to find and cut up the pieces. 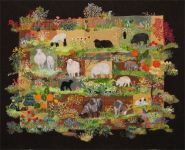 If you don't have a sewing machine, the background seams can be sewn or felted together by hand, or felted using a felting machine which has 12 needles, using overlapping wool fabrics. Needle felting supplies are available below. You can tack the critter/letter appliques down to the backgrounds just before you felt them with roving. They won't move or come off while you are felting. This saves you from fusing the pieces together. I used only six different embroidery stitches to for the places where different wool fabrics are joined together. You will need some embroidery threads. I used pearl cottons, but I am beginning to use floss as well, because you can vary the thickness. The felting tool is #8901 from Clover and it has 3 needles close together in a pen style holder. You'll also need a piece of upholstery foam to use under you project to protect your leg or table. Most of my rovings are hand dyed making them have a many shades in one 4"x 6" baggie. The listing below is for 10 baggies in colors and different textures. If you would like me to put together a group of hand dyed wools together for you, with coordinated fibers, please email me (info@critterpat.com), or send a message with your order about what colors you like. I will send you a photo or two with a special assortment for your approval. You will also need scrap wool fabric to use for your appliques. The color doesn't matter since it will get covered by rovings.